Understanding exposure starts with understanding the 3 parts of the "exposure triangle". 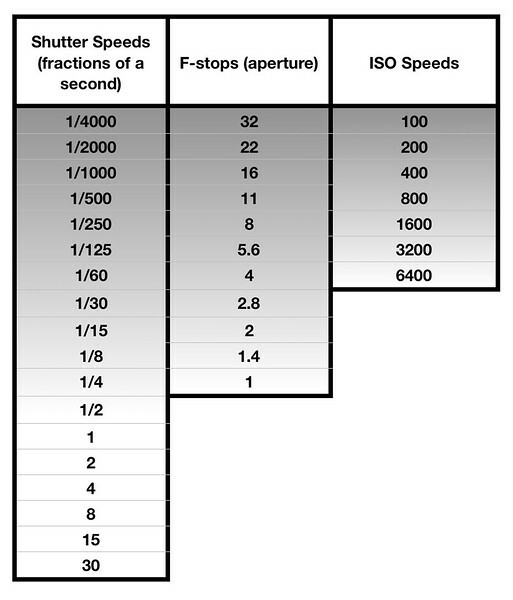 Shutter speed, aperture, and ISO speed. This subject can be difficult for photographers to understand but once you do, everything else is easy. I assume you are using a digital camera so you have a sensor and not film. But the concepts work the same with film. The shutter speed controls how long light hits the sensor. A slow shutter speed of 1/4 leaves the shutter open for 1/4 of a second and a fast shutter speed of 1/500 leaves the shutter open for 1/500 of a second. For those of us that don't like math, think about it like this. If you cut a pie into 4 pieces (1/4) you end up with much larger slices than if you cut it into 500 pieces (1/500). Each slice of pie represents the amount of time the shutter is open (slices of time). Stopping down the lens refers to moving from smaller to larger f-stops. Moving from f/4 to f/5.6 decreases the aperture 1 whole stop. Opening up the lens refers to moving from larger to smaller f-stops. Moving from f/5.6 to f/4 increases the aperture 1 whole stop. When the largest aperture (smallest f-stop) for the lens is selected, that is called "wide open". The ISO speed refers to how sensitive the sensor is to light. The more sensitive, the less light it takes to make an exposure. A shutter speed of 1/4000 of a second will make a darker image than 1/2 of a second will. This is because the light is reaching the sensor for much less time at 1/4000 of a second than at 1/2 of a second. A shutter speed of 1/4000 of a second will freeze motion where 1/2 of a second will blur motion. An aperture of f/32 will make a darker image than f/1.4 because f/32 is a smaller opening so less light is getting thru. An ISO of 100 produces a darker image than ISO 6400 because ISO 100 is less sensitive to light than ISO 6400. Figure 1 has three columns. One for shutter speed, one for f-stops (aperture) and one for ISO speeds. They are not related on the chart except the settings at the top of each column produce a darker image than the values below. Note that these are all whole stops. 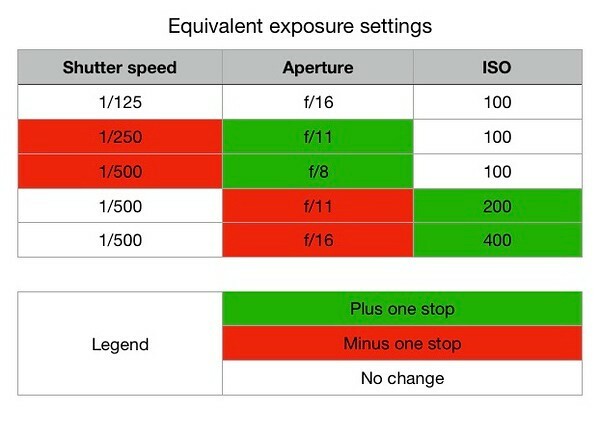 Your camera probably allows you to set your values in 1/3 stops so you will see more options on your camera than on this chart. A stop of light is a measurement of light. 1 stop of light either doubles, or halves, the light in the exposure. For example, a shutter speed of 1/500 lets in half as much light as 1/250. That same shutter speed of 1/500 lets in twice as much light as 1/1000. 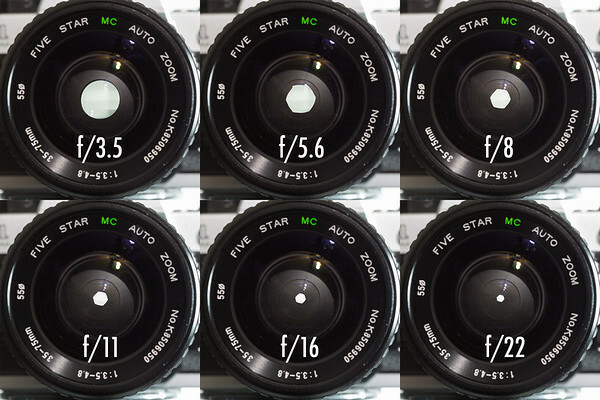 An aperture of f/8 lets in half as much light as f/5.6 but twice as much light as f/11. This will become important below. Once you understand the 3 parts of exposure you can start to understand how they relate to each other. The 3 parts of the exposure are referred to as the exposure triangle. A proper exposure is one in which the image is not too bright and not too dark. There is a difference between a properly exposed image and a creatively exposed image. More on that later. For now, lets assume a proper exposure for shooting outside during bright daylight is f/16, ISO 100, 1/125. If you want to increase the shutter speed to freeze the motion of a running child, you may need to select a shutter speed of 1/250 of a second. Remember that will make the image darker because it is letting half as much light (1 stop) in so you have to compensate with a more sensitive ISO speed or a larger aperture. Figure 3 shows 3 different exposure settings that will create the same properly exposed image. f/16, 1/125, ISO 100 = f/11, 1/250, ISO 100 = f/16, 1/250, ISO 200. The values in red are the ones modified from the original exposure in the top left corner of the graphic. Metaphor for the exposure triangle. There are several metaphors being used for the exposure triangle but I have only been marginally successful using any of them. But here is one that I like. Imagine you have a garden hose. The width of the hose (the aperture) determines how much water gets thru. Now imagine the faucet is the camera shutter. When the faucet (shutter) is on water flows, when the faucet is off water does not flow. And finally image there is a bucket that represents the ISO speed. ISO 100 would be a large bucket because it needs a lot of water (light) to fill. 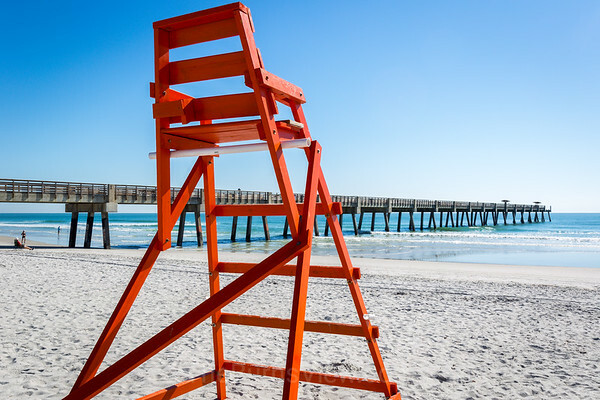 An ISO 200 would be half the size of the ISO 100 bucket. 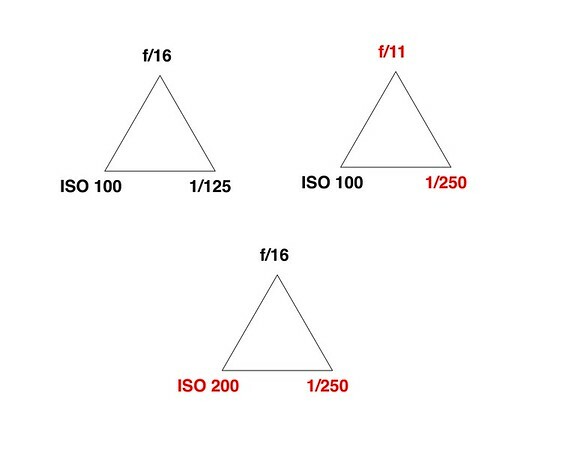 An ISO 400 bucket would be half the size of the ISO 200 bucket. The size of the hose (aperture) determines how long the faucet (shutter) has to be on to fill the bucket. Imagine your faucet has to be on for 4 seconds to fill the ISO 100 bucket. Since an ISO 200 bucket is half the size of the ISO 100 bucket, the faucet only has to be on for 2 seconds to fill the ISO 200 bucket. If you double the width of your hose (aperture), twice as much water (light) would flow. That means you have to leave the faucet (shutter) on for half as long to fill the bucket. In the previous example, we had to leave the faucet (shutter) on for 4 seconds to fill the ISO 100 bucket. If we double the width (aperture) of our hose and left the faucet (shutter) open for 4 seconds we would overflow (overexpose) our bucket. We would need to leave the faucet open for 2 seconds to properly fill (properly expose) our bucket. If you want to leave your faucet (shutter) on for only 1 second, you have to either get a larger hose (aperture) or a smaller bucket (ISO) or both. This is why it's referred to as the exposure triangle. Changing one value affects the others. The chart below, figure 4, is another example of exposure equivalents. The top line is the starting correct exposure. Each line below is a modification of the line above. The red blocks are where we lost 1 stop of light and the green blocks is where we gained that stop of light back again. All 5 of the exposures will produce the same correctly exposed shot. A creative exposure is a proper exposure that is used in a creative method. Do you want to freeze the the motion of a passing train (figure 5)?, or do you want to blur the train's movement as it speeds by (figure 6)? You control this by controlling the shutter speed. Are you wanting to isolate your subject from the background (figure 7) by blurring the background or do you want to tell a story (figure 8) with a photo that is in focus, front to back? You control this by controlling the aperture setting. Although you can control the creative exposure by controlling the settings manually, there is an easier way to get started with creative exposure. 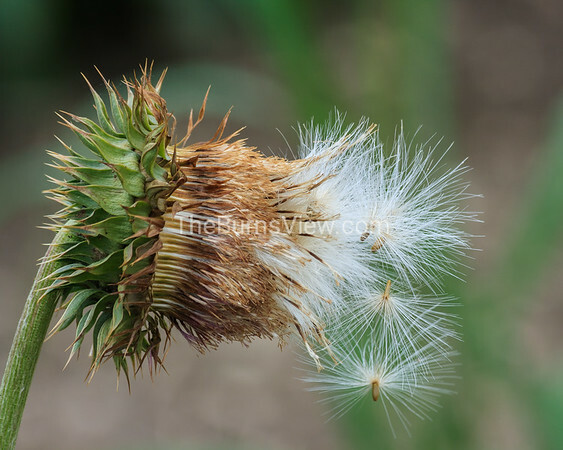 There are shutter priority and aperture priority modes at your disposal. Aperture priority allows you to tell the camera what aperture you want to use and it will choose the shutter speed that will create a proper exposure. Shutter priority allows you to tell the camera what shutter speed you want to use and it chooses the aperture that will create a proper exposure. If you want to freeze or blur the motion, choose shutter priority. If you want to shoot an isolation or storytelling shot, choose aperture priority.